I write to you from my heart. Just hours ago, the President closed our borders to all refugees and also immigrants from seven primarily Muslim countries — a de facto Muslim ban. The danger of this presidency is no longer hypothetical — it is happening now. Since the Inauguration, the President has signed a cascade of executive orders that threaten the safety and lives of hundreds of thousands of people – refugees, immigrants, Muslims, the indigenous, Black people, and all working people in need of healthcare. He has directed our government to construct a wall on our southern border, punish sanctuary cities, facilitate the repeal of the Affordable Care Act, and construct pipelines despite the protests of indigenous people. And he has signaled more to come, including rolling back voting rights. Altogether, these policies target people for who they are, not for anything they have done. They do not make our country safe. To the contrary, when the government profiles particular communities, it emboldens hate crimes against families like mine. As a Sikh, an American, and a mother, I cannot continue with life as normal. I know that I’m not alone. Hundreds of you joined our fast and multifaith prayers on Inauguration Day. Millions of us marched. Yet with every stroke of the pen, we are watching the America we love and have fought for — a nation that stands for equality, liberty, and justice — die. And so, we are left asking: what do we do now? Together with Rev. 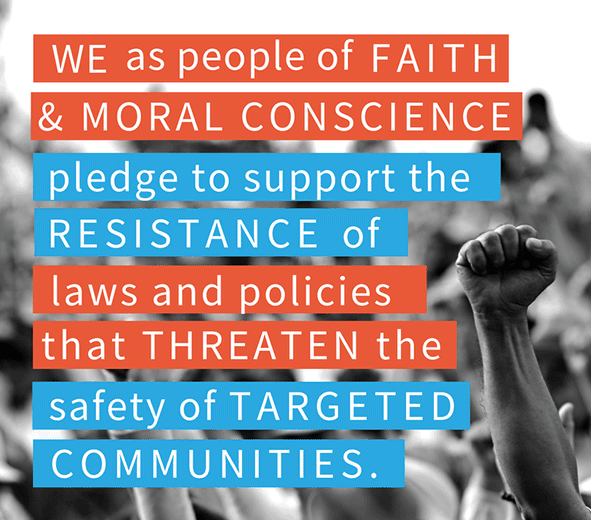 William Barber II and a coalition of faith leaders around the nation, we are preparing for direct actions to protest the laws and policies of this administration. Our aim is to resist the normalization of these decisions and to fight for the people who are most harmed — with our lives. Will you support us as we take this next step? Please sign up here to pledge to join OR support us in a season of civil disobedience. Whether you want to be a protester, legal observer, witness, medic, or care provider, we need you. Civil disobedience is the breach of law in order to change culture and policy. Nonviolent civil disobedience is grounded in the ethic of love — for others, opponents, and ourselves. Historically, when people use civil disobedience to protest not just a single policy but widespread injustice, then this act of love becomes revolutionary. It changes a community, a culture, even a country. Every generation in the U.S. has used civil disobedience as the most potent and immediate form of moral resistance. Abolitionists refused to hand over escaped slaves in violation of fugitive slave laws. Women marched and led hunger strikes in the suffrage movement. Black students organized sit-ins at segregated counters in the civil rights movement. And most recently, water protectors faced hoses and freezing temperatures in order to protest the building of a pipeline through Standing Rock. I have a two-year old son. I ask myself: How can I consider civil disobedience when I know the costs? Yet as I watch him grow up in a nation more dangerous than the one I was given, how can I not? In his Letter from a Birmingham Jail, Dr. King wrote that all nonviolent campaigns have four steps: collecting evidence of injustice, negotiation, self-purification, and direct action. The President’s executive orders confirm evidence of injustice. Faith leaders have continued to ask for a meeting with no response. Many of us have fasted, prayed, or meditated in self-purification. (You can take this 6-hour meditation with Repairers of the Breach on how to prepare for moral resistance). As I said in a recent speech alongside Dr. Barber: What if this darkness is not the darkness of the tomb, but the darkness of the womb? What if our nation is not dead but a country still waiting to be born? What if the story of America is one long labor? The midwife asks us to breathe and push. Because if we don’t push we will die. If we don’t push now, our nation will die. So let us take one another’s hand and push together.